Tad telling Susan about what Jess said in her interview. Harold and Karl discuss him questioning his faith, all he wants is a few more weeks with Madge. He goes to check on Madge and Karl lets himself out, frustrated that he can't do any more. Steph is telling Lou of her management problems, but he's got his own problems – no chef for the pub competition and the judge will be there soon! Steph suggests steak but the judge of the pub competition is a vegetarian. They begin to talk about Madge, and it suddenly comes to Lou to use Madge's cookbook for a recipe. Tad and Paul are sitting waiting for news of Madge. Jess comes in and smugly tells them that Susan has been suspended. It's not what they really want to hear right now and Paul angrily telling her to sit at another table. Once she leaves Tad has a go at him and they begin to argue. Eventually Paul tells him to go speak to Jess, and try and get the truth about Susan, but Jess doesn't want to talk. Lou sends Matt out for some ingredients and tells Steph about the recipe he found in Madge's cookbook. He wishes her luck trying to sort out her managerial problems. Just as she's leaving, one of her “problems” comes in wanting to talk to her. Harold has brought Madge some ice-cream that she's been craving, but she isn't hungry. Harold brings over the photo album to the bed and they start to reminisce over them. Suddenly she starts panicking about her will but Harold calms her down and they go back to looking through the families. Steph is trying to tell Steve he's got to be let go from Moco when he tells her he's been given another job. Privately she is very relieved. Tad and Jess are arguing over her treatment of Susan. He asks her why she always wants to hurt people. She doesn't answer but instead gets up and leaves. Susan comes home with a box of her personal effects from the school. Karl suggests taking a break from work but Susan dismisses it. Libby suggests using the time off instead to go to London for Mal's wedding, but Susan says she's already thought of that. Darcy says he'll cover for Karl as long as necessary. Matt and Lou enter the office with a pan of Madge's ‘Spag Madge'. They both think it looks and tastes good and hopes the judge thinks so too. Harold is arranging some flowers when Karl comes in. He offers Harold his help as he has the day free. Harold asks if he can just be around. The boys arrive home wanting to know how Madge is. Harold tells them she doesn't have very long. Tad wants to see her and Paul follows too, but Harold stops him so Tad can go in by himself. Tad goes in to see her and she calls him over. Tad tells her he doesn't want her to die or he'll “come looking for her,” and he's got lots of plans and he wants her there. Tearfully he promises to study hard and tells her he loves her and kisses her. He leaves to let Paul go in. The judge (Brian Curtis) finishes his meal raving about the meal and wanting the recipe. Lou tells him he can buy the cookbook instead. Brian tells Lou he should make ‘Spag Madge' a permanent feature of his menu and that the pub is on the shortlist of the competition. 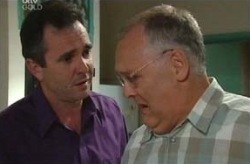 Lou tells Matt he's off to tell Madge how she saved his bacon. Paul is now in with Madge. Tearfully he tells her she's been the best mother he could ever have. She tells him she'll be watching him and that Harold will be there for him. Madge tells him to follow his dreams. Paul moves off the bed to let Lou in. Lou tells her how she saved his bacon, jokingly suggesting changing the name from ‘Spag Madge' to ‘Spag Lou'! Steph, Drew and Libby are discussing how she solved her management problem. They talk about Woody's forthcoming release from prison and how good it will be …once she's told Lyn and Joe about him staying there. Drew has put up Dee's wedding present to them – an ugly painting that they can't bare to look at. They wonder if there is any news about Madge yet but Libby says Susan said she'd call. Madge is thanking Lou for his letter and what a great friend he has been. Sensing time is running out he kisses her and leaves to let Harold and the Boys in. They're all gathered round her. 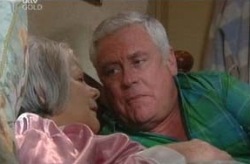 Harold tells Madge he loves her very much. She tells him she loves him and he's to go to Paris for her. 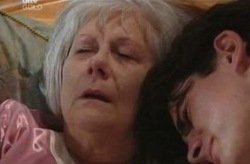 Harold starts talking about what they were going to do in Paris and she peacefully dies. Harold is distraught. As the credits come up, the usual sung theme tune is replaced by a piano version of it instead.